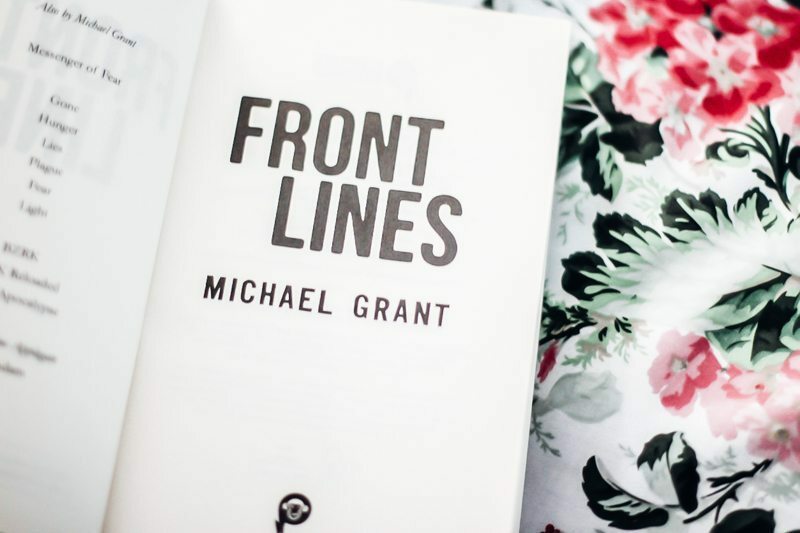 It’s my pleasure to announce that I’m a part of the blog tour for Michael Grant’s latest novel, Front Lines, and that I’m here to welcome him on the blog today! 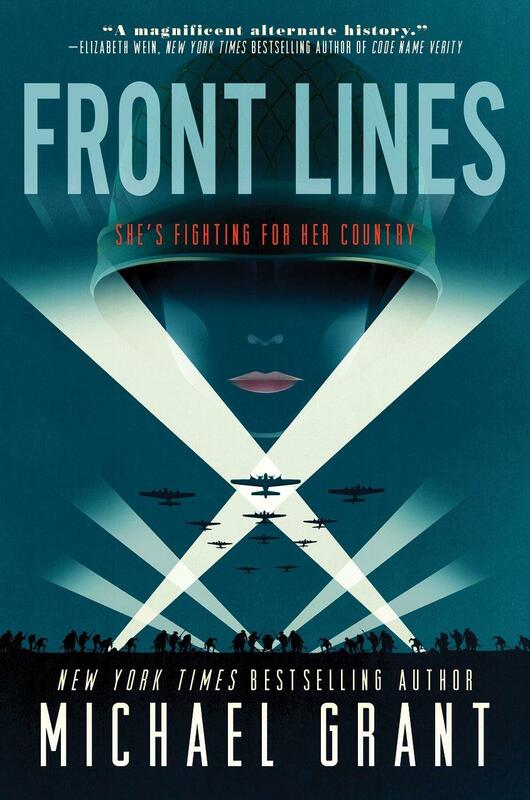 Having been a fan of his Gone series, and being utterly excited for his newest historical fiction, I can’t wait to hear all about why Michael decided to write Front Lines! 1942. The fate of the world rests on a knife’s edge. And the soldiers who can tip the balance… are girls. Today, I’ll answer a single question: Why girls? Why did I choose to write an alternate history of World War 2 in which women serve in combat alongside men? Let me start by saying I never subscribe to single-motive theories. Everyone does everything they do for multiple reasons, sometimes even contradictory reasons. We love to reduce things to binary: X did Y to Z for Reason A. I believe X did Y to Z for Reasons A, B and C.
A) That I wrote FRONT LINES to somehow cash in on feminism. Sigh. I’m old, been around a long time. I was alive and semi-aware when modern feminism was born, and I can tell you one thing for sure: no one gets rich off feminism. I mean, I’m sure Gloria Steinem has a nice bank account, but really feminism is not exactly a cash cow. B) That I wrote FRONT LINES to appeal to YA readers who are mostly female. Well, duh. In addition to being in ”the arts” I am also in “the business,” and yes, I do try to write books that will sell well. Obviously. But anyone who imagines that writing a trilogy of 500+ page, heavily researched books in a genre (YA alt-history) that essentially does not exist, is some kind of obvious path to fame and riches really, really does not know what they are talking about. FRONT LINES is a risky series, quite unlikely to produce big profits for me or my publisher. In fact, every time I sit down to write I intend to write a bestseller, and every time I self-sabotage by making it too different, too strange, too unusual, or as I like to think of it: too interesting. I actually love history. Immediately before I sat down to write this piece I was listening to the Revolutions Podcast which is currently working through the Haitian Revolution. What kind of person actually cares about the Haitian Revolution? Well, me, apparently. As someone who enjoys history as the backstory of the human race, I despise the way we teach history, at least in the US, where we reduce it to a series of inspirational stories on the one hand, and the wearing of hair shirts on the other. So part of my motive was to say, in effect, I can do better. I can give kids a realistic, visceral feel for what WW2 was like to a GI. Because history should not be just dates and the names of various generals, dictators, and presidents. Nor should it be a series of facile moral lessons. History is a gigantic mall just absolutely stuffed with cool stories – none of which you’ll learn about from the state-sanctioned history texts weighing down your book bag. Then, I wanted an angle. I had decided that I wanted to write about WW2, but I was also aware that to most kids WW2 is some movie their parents make them watch, or a series of disconnected dates and incidents in a history textbook so boring it causes readers to sink into a coma. I needed a hook that would push all that sepia-toned stuff aside and let me make it new and fresh and interesting. So, I thought: Hmmm, what if I just sort of invent a Supreme Court decision and get women into the shooting war? Another motive was personal: I wanted to step outside my comfort zone. I have never written historical fiction before, and I thought it’d be a challenge and also fun. Now that I am officially too old to die young, I don’t want to get lazy or self-satisfied. I don’t just want to write stuff that’s easy for me to do. I worked hard on FRONT LINES. I enjoy working hard. I am very proud of the result. Remember up above when I said that sometimes motives are contradictory? I like to sell, I know dystopia sells, so in the last eight years of dystopia madness, what have I been writing? Hard, nihilistic sci-fi, (BZRK), horror, (MESSENGER OF FEAR) and alt-history, (FRONT LINES.) Because even if I want to sell, and know what is likely to sell, I just cannot bring myself to join someone else’s parade. At the same time, there is huge interest in fiction where women and girls play a bigger, more active role, which dystopias facilitate. When I was growing up the only thing a woman character was good for, was tripping right in front of the monster, screaming helplessly, and being rescued by some stud. In the 90’s we got Buffy and Xena and, if I may take a bit of credit, Rachel from ANIMORPHS, which my wife and I created together. Rachel was unique for the time. She did not trip and scream, she turned into a grizzly bear and sank her teeth into the necks of aliens. She wasn’t “just as tough as the boys,” she was tougher; she was scarier; she was more ruthless. Of the six characters at the heart of ANIMORPHS, male and female, the one you really did not want to piss off, was Rachel. I have a long-standing investment in the notion that female characters are not props or foils. From some quarters I get the more general, and frankly odd question of why I – a white cis-male – would write about women, African-Americans, gays, religious minorities, etc… Am I trying to prove something? Am I pushing an agenda? Am I a self-hating white male? Here’s the thing: I’m an American. My country is full of all kinds of people, every race, every religion, every gender, every interest group, every everything. I tend to write large casts, and given that my large casts are usually Americans, it would require an act of will on my part to deliberately exclude what amounts to about 3/4 of the population. The question should not be, “Why does Michael Grant write a lot of non-male, non-white characters?” The answer is obvious. Walk through any American city. See how the people you pass come in various colors and shapes and preferences? That’s why. There they are, those non-white, non-male, non-straight people, they exist, and I cannot think of a single reason why I would choose to exclude them from my books. Finally, there is one motive that rises even above my desire for fame, fortune and the admiration of my peers: fun. I still want this job to be fun for me. So if any of the above explanations fail to do it for you, the simple, all-purpose answer for “why?” is: ‘cause I thought it would be fun. So, why girls fighting World War 2? I thought it would be fun. 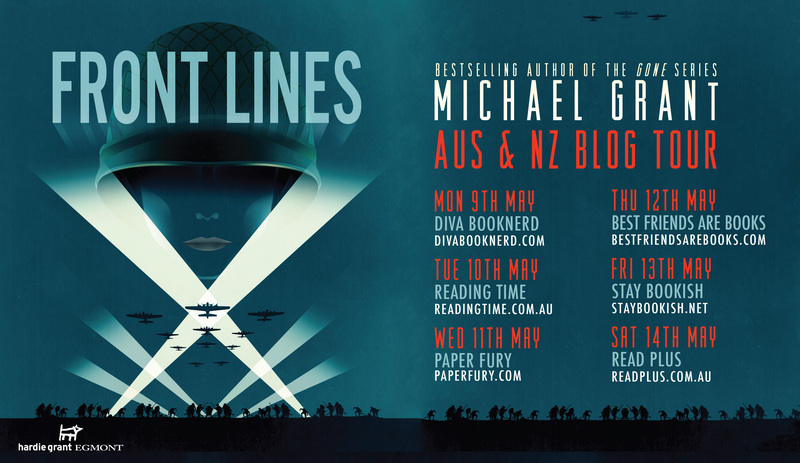 Bestselling YA author Michael Grant is in Australia and New Zealand to promote Front Lines, the first book in his blockbuster new YA series, Soldier Girl. 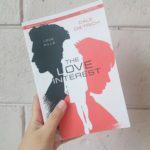 Check out the rest of the blog tour below!